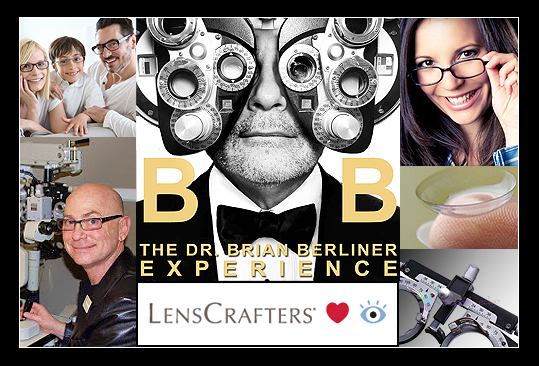 Dr. Brian Berliner & Associates welcomes patients of all ages to both of our friendly offices conveniently located inside LensCrafters. Though our practices are located in Huntington Station and Lake Grove, we've been proudly serving Greater New York and Long Island for over 25 years. Trusting our stellar reputation and complete range of eye health and vision services, patients come to us from Huntington Station and Lake Grove as well as NYC, Garden City, Nesconset, and Lake Ronkonkoma. Our Lake Grove and Huntington Station offices also feature the latest devices for Digital Retinal Imagery, Corneal Topography, Visual Field analysis, and a Scanning Laser Ophthalmoscope. Using this equipment and their top-notch skill, Dr. Brian K. Berliner and team will provide you with highly accurate diagnoses and treatment. Our location inside LensCrafters makes it simple for you to purchase new eyeglasses. Once you receive an updated vision prescription from your eye exam, you will be able to select new eyewear from the LensCrafters optical collection, which will be crafted and ready to take home within one hour in the on-site lab. Enough about us. We want to learn more about you and your vision! Contact us to book an appointment for an eye exam, or stop in at one of our Long Island vision care offices today.